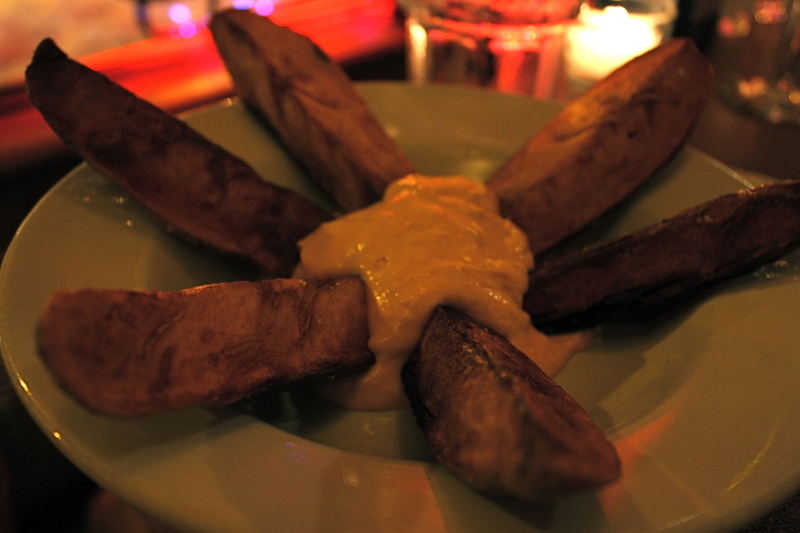 On Wednesday when I picked the fella up from the airport, he mentioned he really wanted tapas. 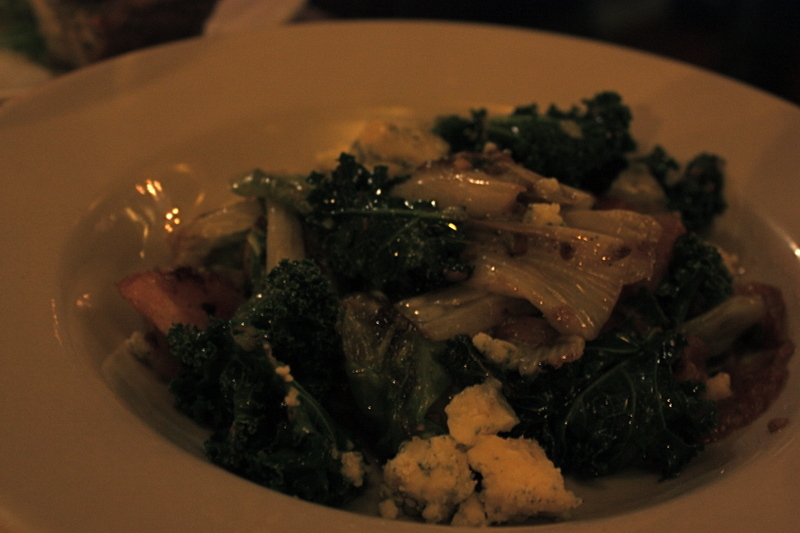 So tonight, we went to a wonderful tapas restaurant here in Ithaca called Just a Taste. 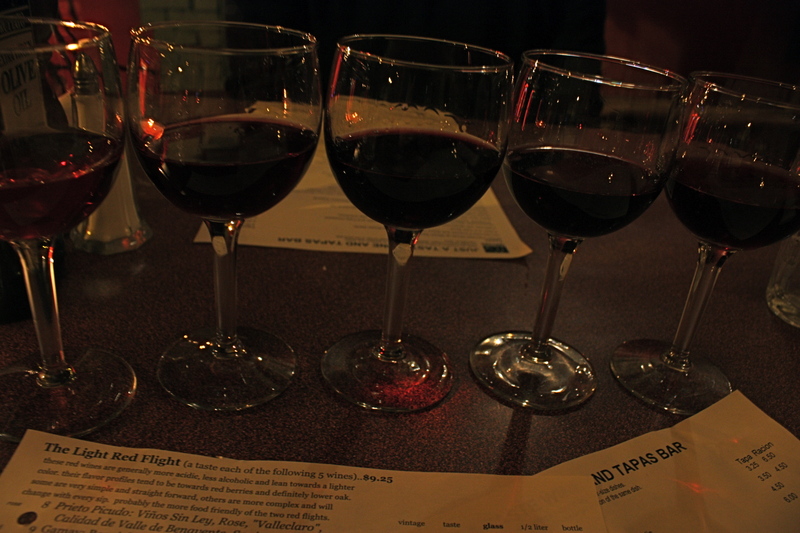 We started with a wine flight. I got the light red flight and he got the Spanish flight. 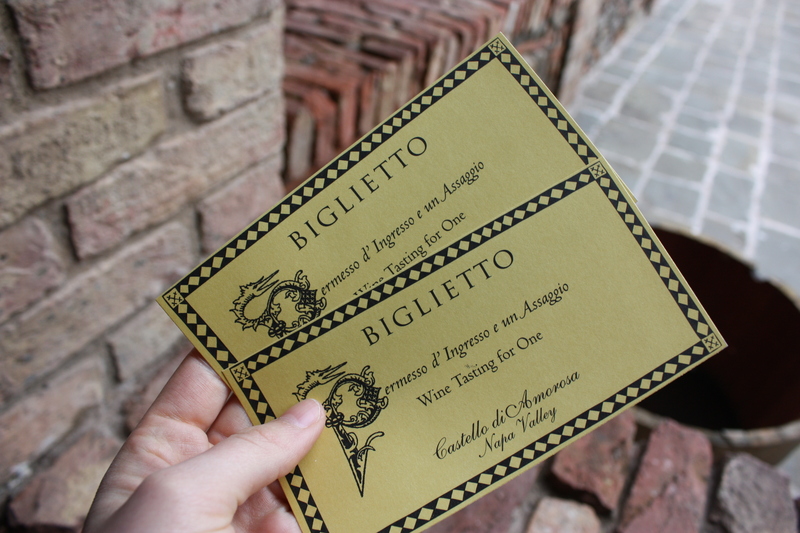 Everything was amazing! The exception was the Mahi Mahi, which I didn’t care for. The lovely fella ended up eating all of it! 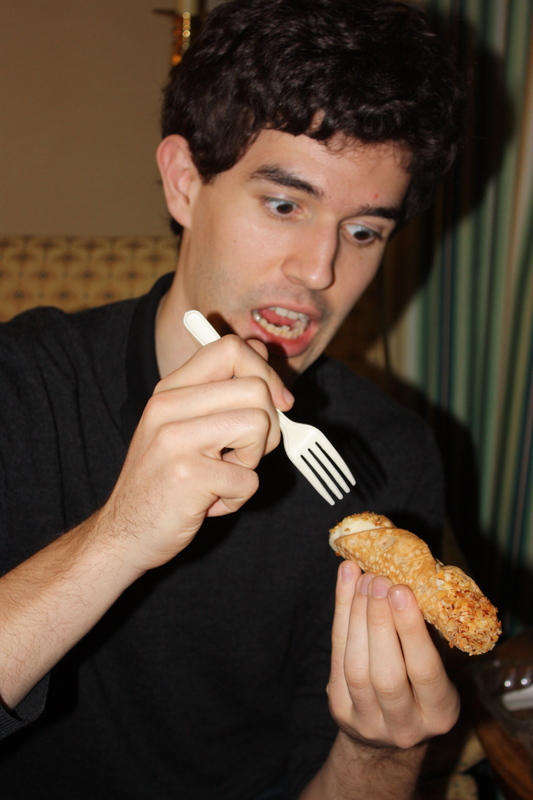 It was too fishy for my taste! If you’re in the Ithaca area, I highly recommend this place! It was very tasty! The lovely fella gives it an 8.6/10. Pretty high rating! Now we’re off to my neighbor’s birthday party! I see more wine in my future. Have a great night!! Hi all! I hope you had a fabulous day! My day definitely turned around. I was sort of feeling blue today mostly because my knees have been hurting like crazy (NEED NEW RUNNING SHOES ASAP). But as I mentioned earlier, I had plans for a fun evening out! 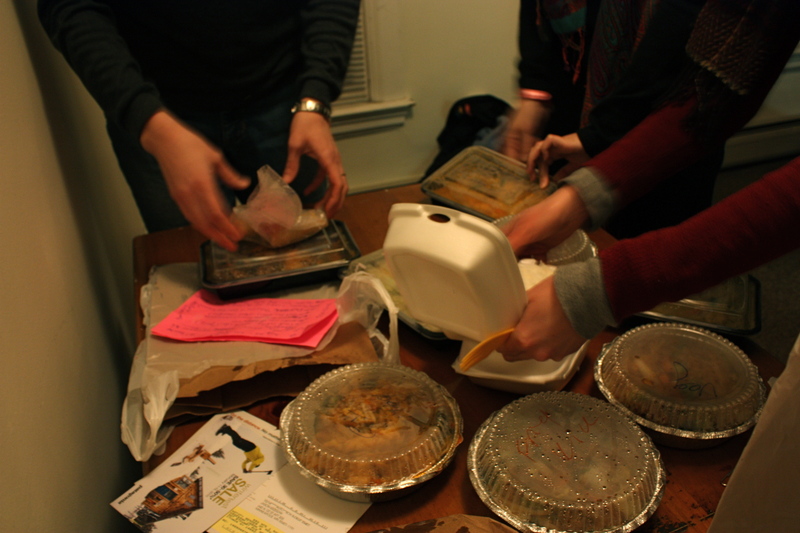 So we headed to Liz’s where we ordered take out! 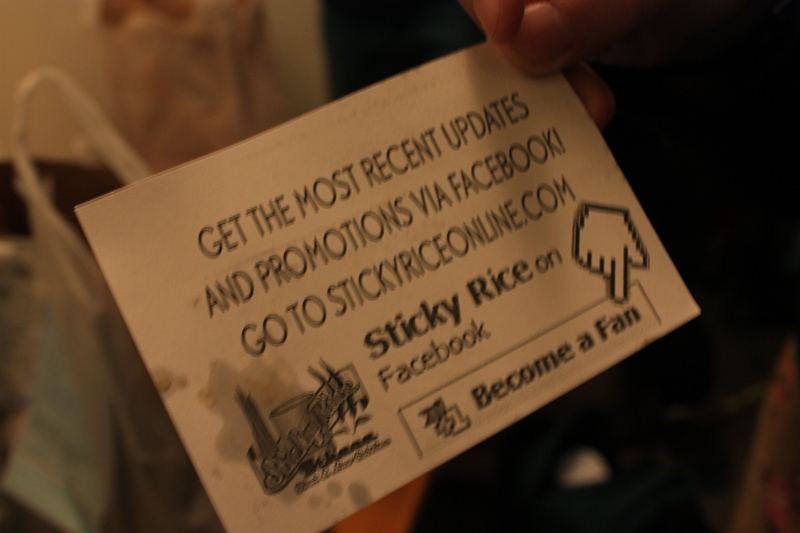 Thai food from Sticky Rice! Purple rice! Have you ever tried it?? Not sure how purple it actually looks in the picture, but it tasted similar to white rice but with a lightly crunchier texture. Delicious! I didn’t get an entree (since I had been a Snacky McSnackerson all afternoon) but I got an order of Sticky Rice with Mango to share with someone. 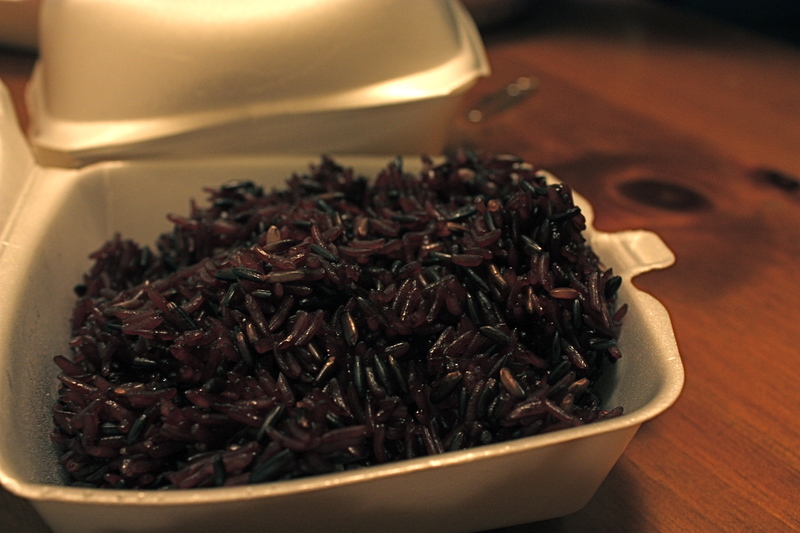 It came with purple rice and was oooh soo soo good! Creamy, sweet and delicious! 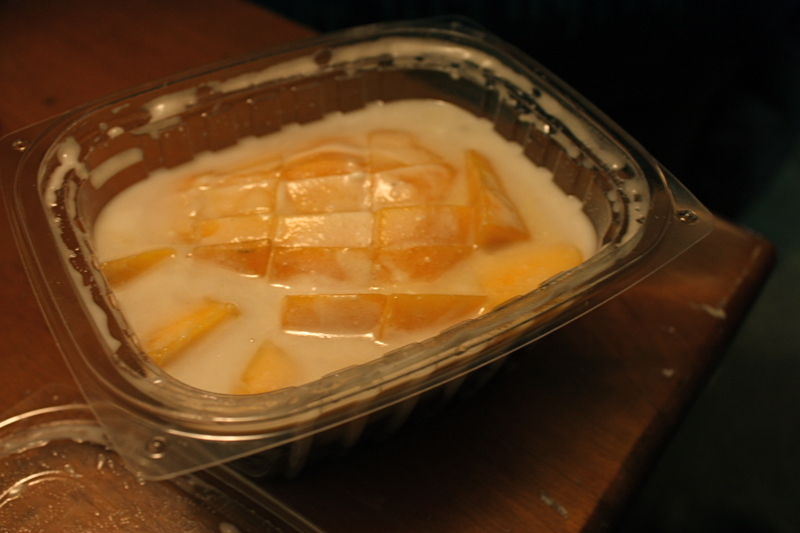 Have you ever had mango sticky rice? If you haven’t… try it asap! 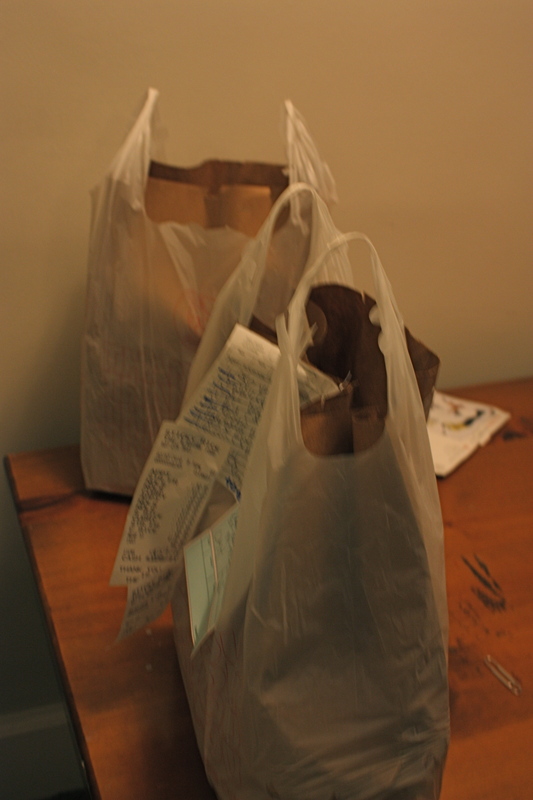 After dinner, as we walked home, the roommate and I discussed going to Wegman’s so naturally we did since I needed baking supplies for my next project (coming soon!). 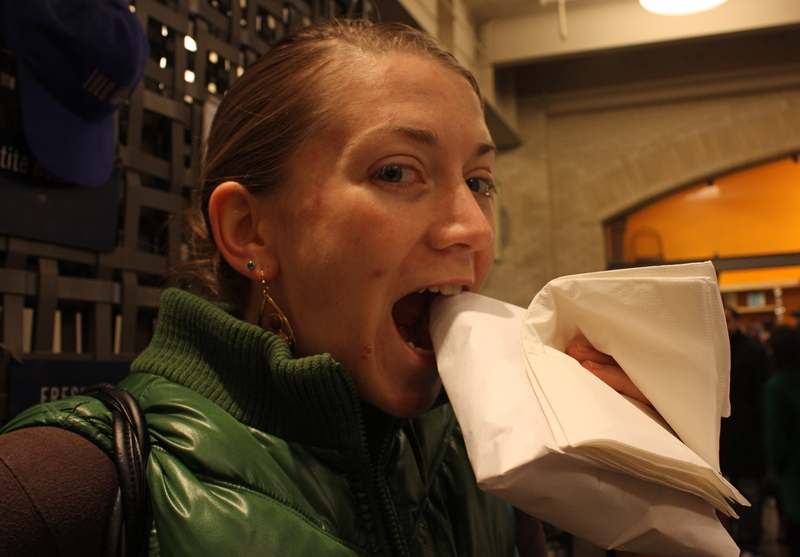 On the way home from the Wegster, Christina (the roommate) was eating a coconut popsicle/bar she had just gotten. 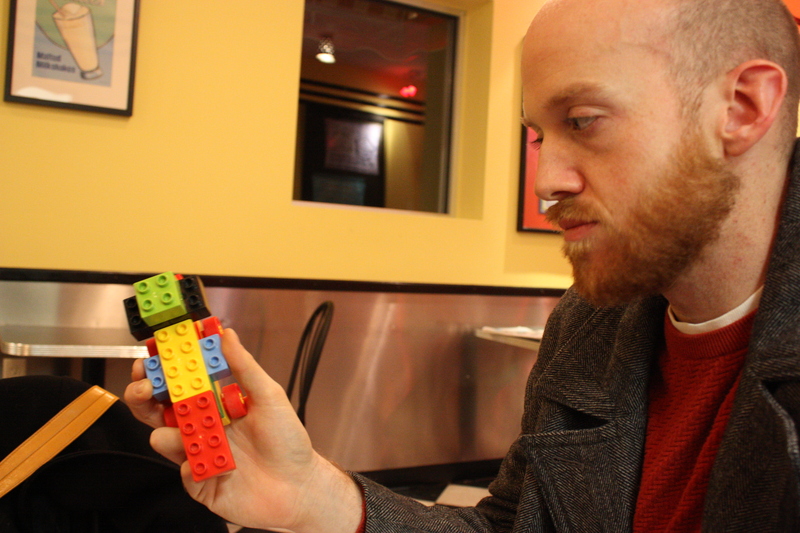 What happens when you eat a frozen treat in 20 degree weather? It sticks to you. Remember A Christmas Story? Anyway, I’m pooped, and I have sooooo much TV/Movie stuff to catch up on… Mad Men, Grey’s Anatomy, Ugly Betty… I also have Fargo to see and a documentary called The Garden that is a watch instantly on Netflix! Thank goodness it’s the weekend! Watch any good TV lately? Hope your night was as delicious as mine! Have a good one! I’m not a runner, but I am occasionally known to go on a jog. I usually prefer to do so with someone else, a running buddy if you will. This morning, Rhoda told me she was going for a run, so I tagged along! I was a little concerned because the last time I ran outside it was 65 degrees (few weeks ago in California). This morning when I went for a run, it was 17 degrees… kind of cold. Rhoda is a pro. She trained for a marathon in Michigan in the winter so she gave me some pointers. 1. Dress in layers. I wore a shirt and a jacket with slightly below the knee running pants (I really should invest in full length pants for this weather!). 2. Wear gloves and something to cover your ears. Forever I had no idea what those big headbands were for. Guess what?? They cover your ears! Do you have any tips for running in the cold? So I headed out and met up with Rhoda. Honestly, it wasn’t bad at all. I didn’t feel cold throughout the entire run. 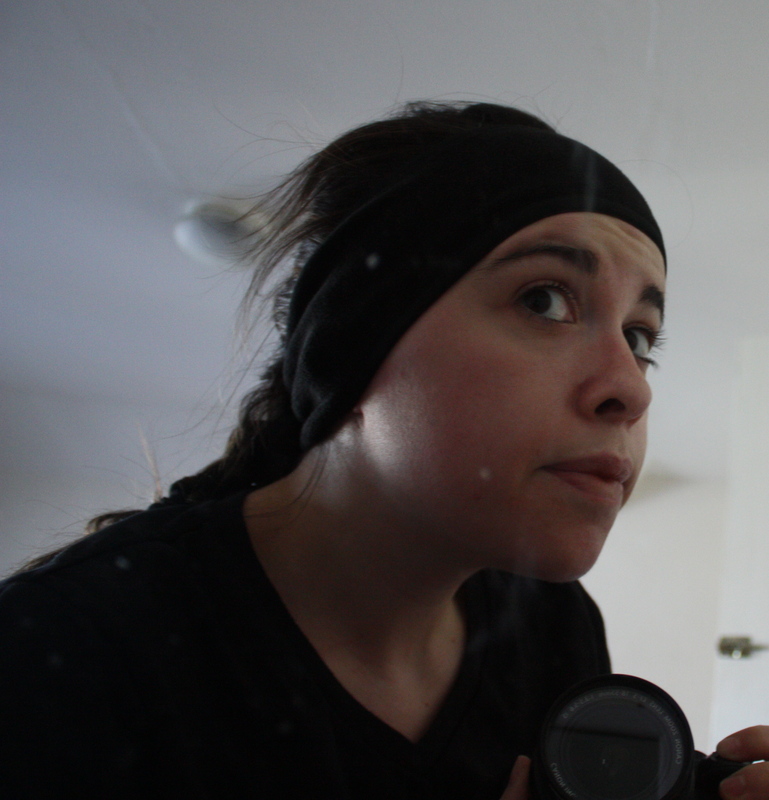 At one point I even pushed my ear warmers back to let my ears breathe a bit and removed my gloves (though only for a few minutes because the back of my hand started to get REALLY cold). I didn’t really get cold until I was walking home after having cooled down. Then I was sweaty/wet and in below freezing temperatures. See the problem? It was great though! We did 4 miles and chatted the whole time! It was also beautiful! I forget how picturesque it is here, especially in the winter. I wish I had brought my camera to take pictures! Oh well, next time! Thanks for letting me slow you down, Rhoda! 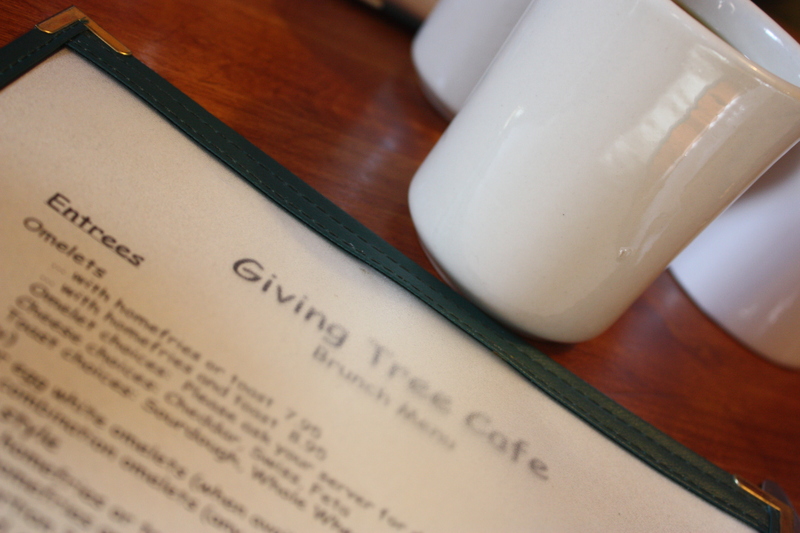 After lunch, I came home and showered then met up with some people for lunch at a new cafe in Ithaca called The Giving Tree. The cafe is a local, vegetarian place. Very cozy and cute with mismatched chairs and such! At this point (around 1:30pm), I hadn’t eaten since breakfast at about 7:30am; I was ready to chew my arm off. I had a really hard time choosing what to order, because the entire menu was vegetarian so there were a ton of options to choose from! 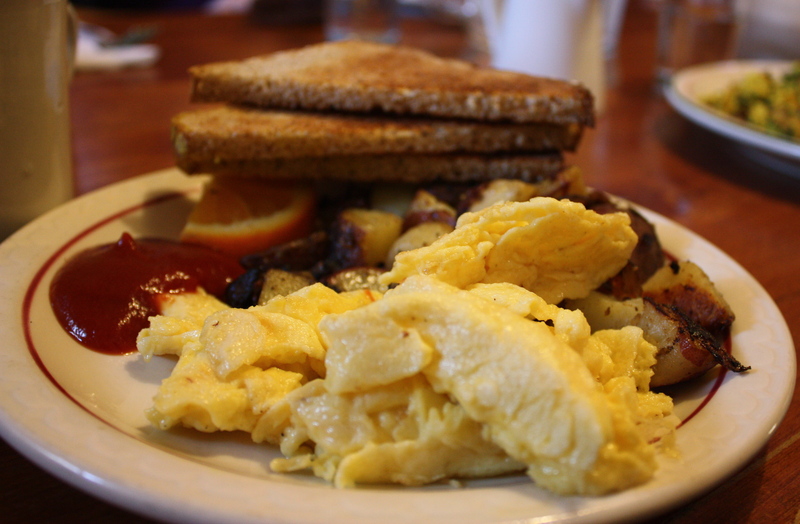 I got some coffee and a plate of eggs, home fries and toast, which is probably my favorite food on the planet! A bit boring, I know, but I had to go with an old favorite. 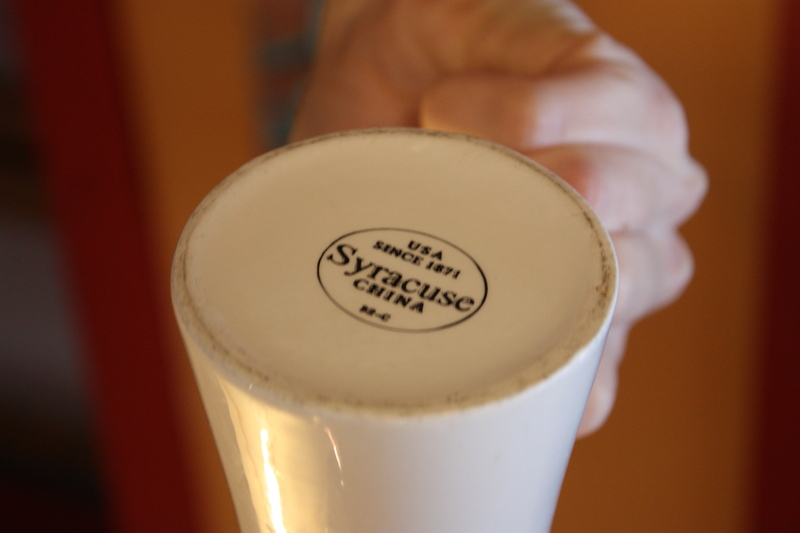 Coffee was served in local Syracuse China. As you can see, I hated it. 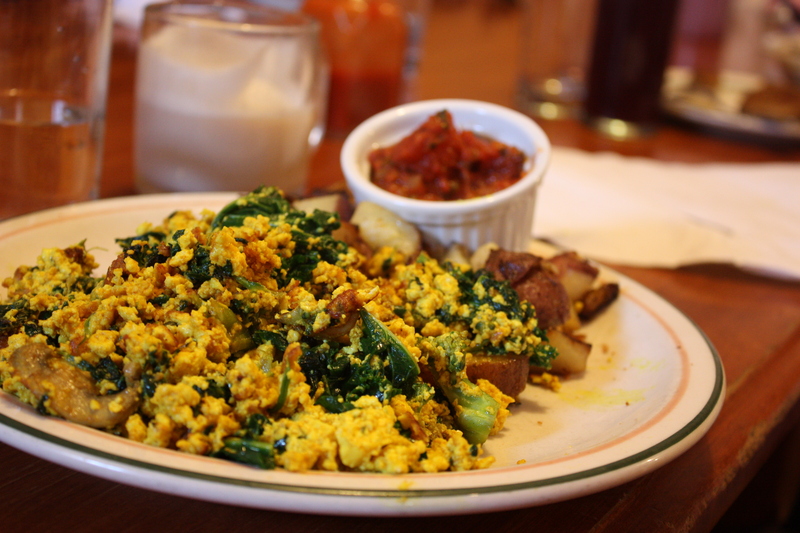 My friend Celia got a delicious tofu scramble with vegetables! I had a bite. I would definitely get that next time! Delish! I can’t wait to go back! Today has been a great day! Thanks friends for making me smile today! The rest of the day, normal eating will resume, and I will enjoy my time watching movies (I have two from Netflix that I’ve been putting off). Hope you all have had a fantastic Saturday so far! 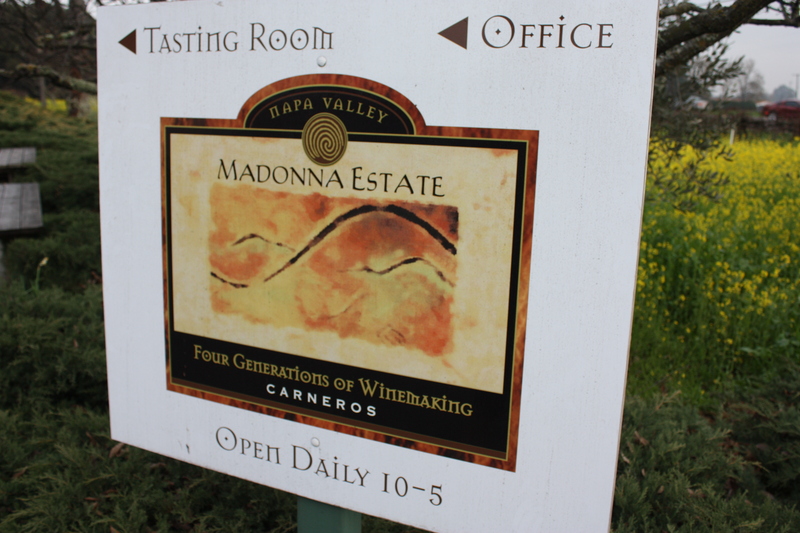 Yesterday we left about mid-day and headed up to Napa! It’s only about an hour and a half drive from the lovely fella’s place in Mountain View. 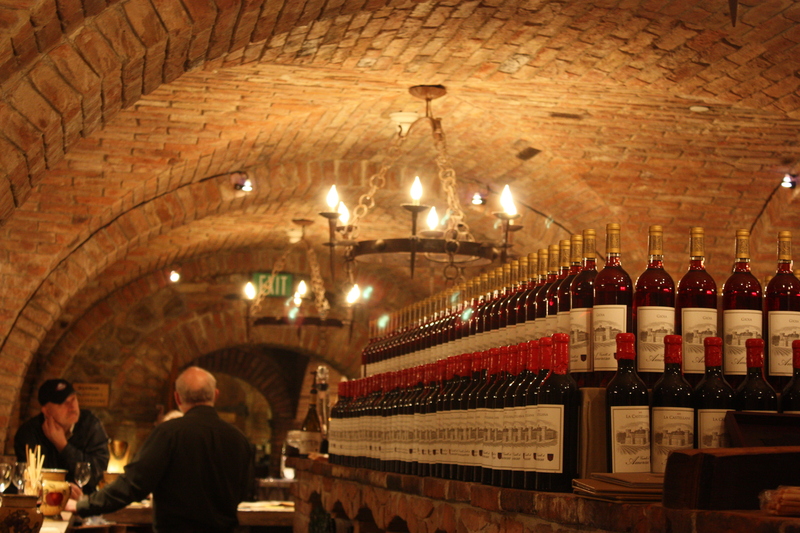 We found a deal on Travel Zoo for a hotel plus wine tastings at 3 vineyards and 3 half bottles of wine! 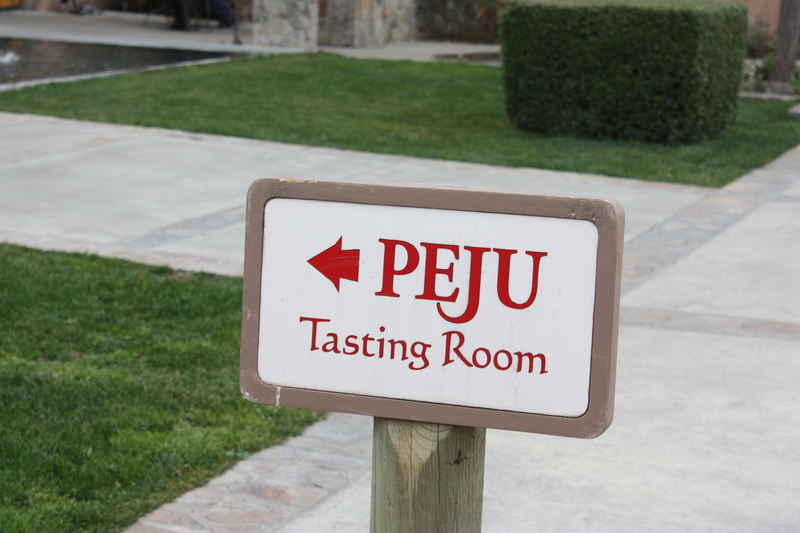 The first stop was Peju. 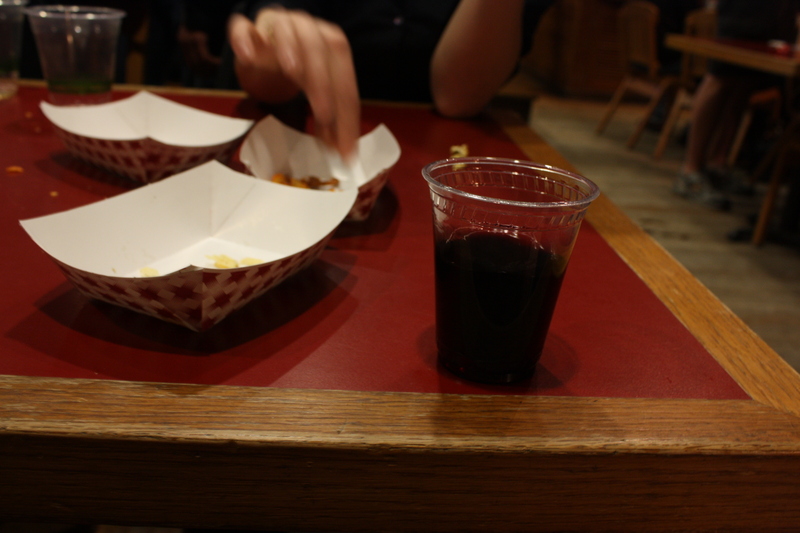 This was one of our free wine tastings. 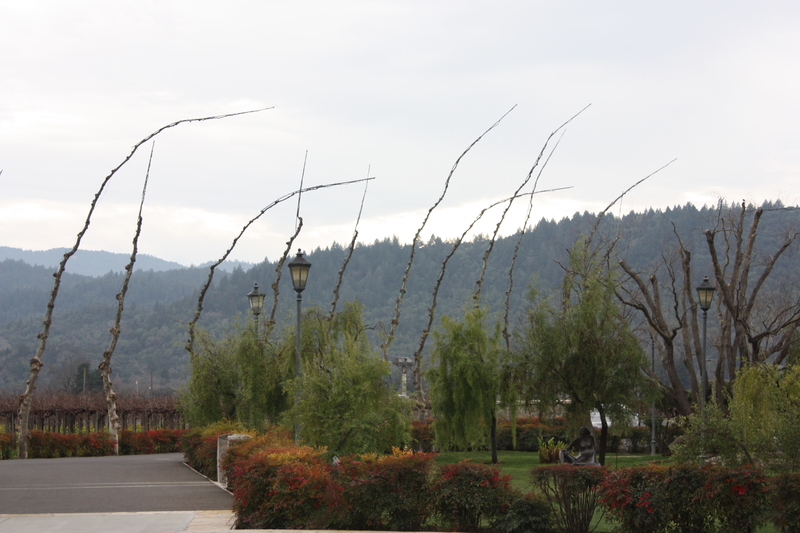 The vineyard and tasting room was very lovely! 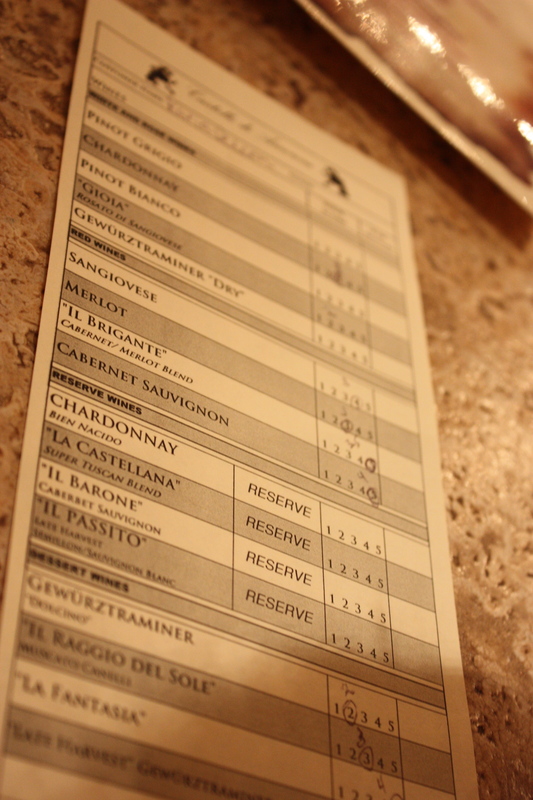 We tasted 5 wines: 1 white, 1 red/white blend, 2 Cabs and a Port. My favorite was the 2005 Cabernet Sauvignon. This also happened to be the half bottle that they gave us! So that was convenient. I liked this place but sadly there was another couple tasting next to us so I felt really rushed. They flew through it and it felt like we needed to go at their pace. Oh well. It was still fun and tasty! 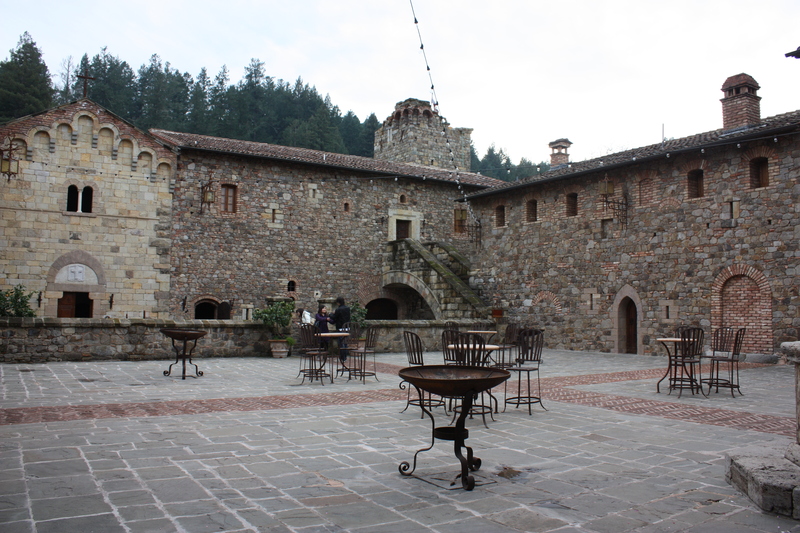 The next stop was: Castello di Amorosa. 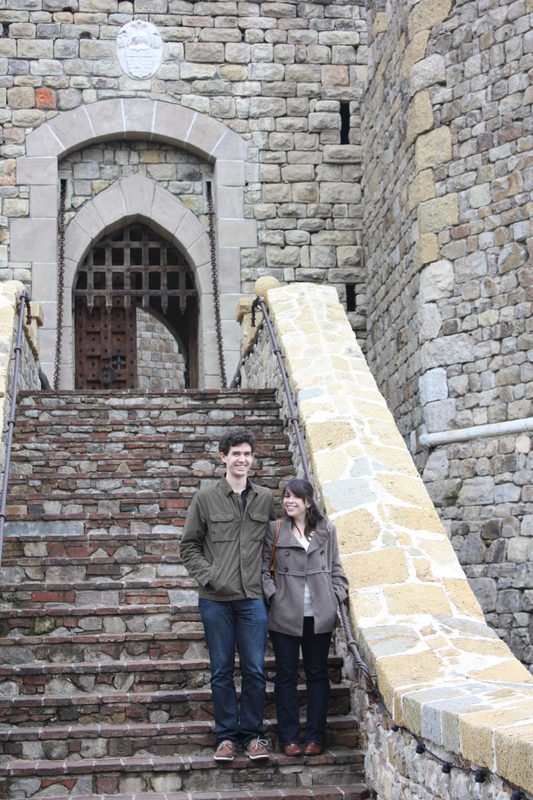 It was a lovely location with a great view, not to mention the winery was in the shape of a castle! This wasn’t included in our three free tastings but the lovely fella heard it was good so we went. I’m glad we did! This was my favorite of the three we went to! 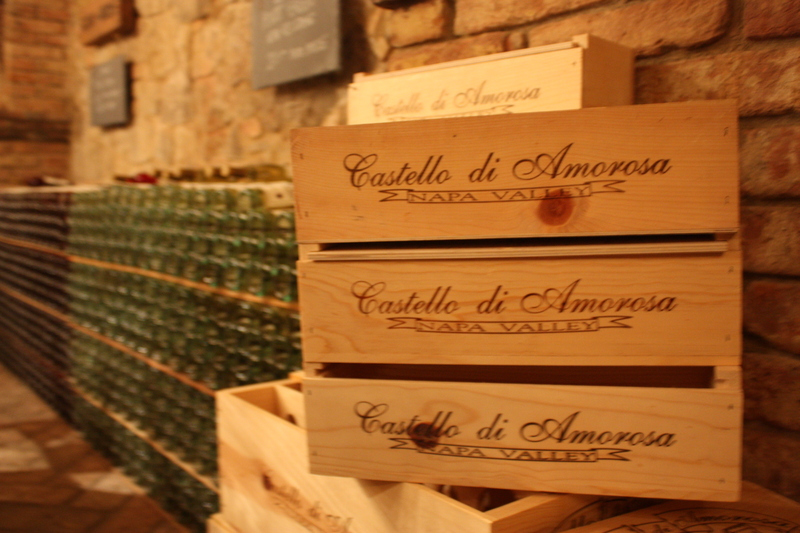 We tried some wonderful wines here too! I don’t usually like sweet wines but the ones here were particularly delicious! The final winery we went to Madonna Estate for a free tasting. It was very small but nice. 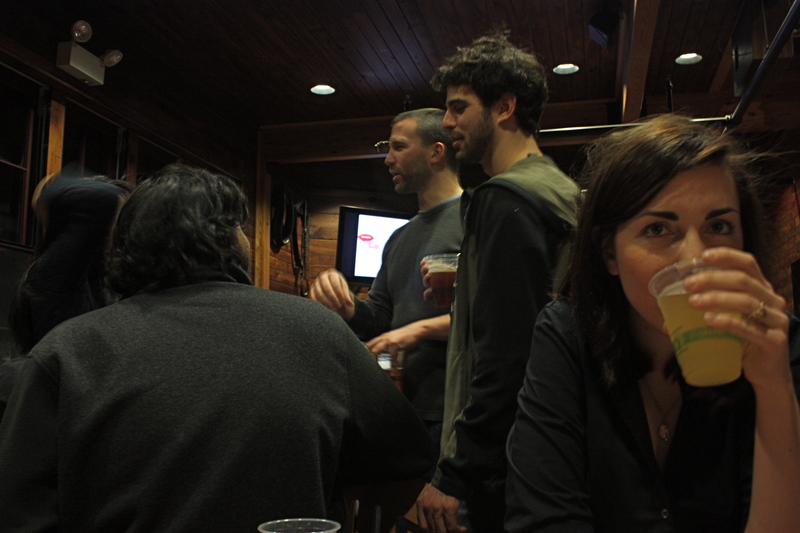 We were the only ones in the tasting room. They didn’t have half bottles so we got a free full sized bottle of Riesling. 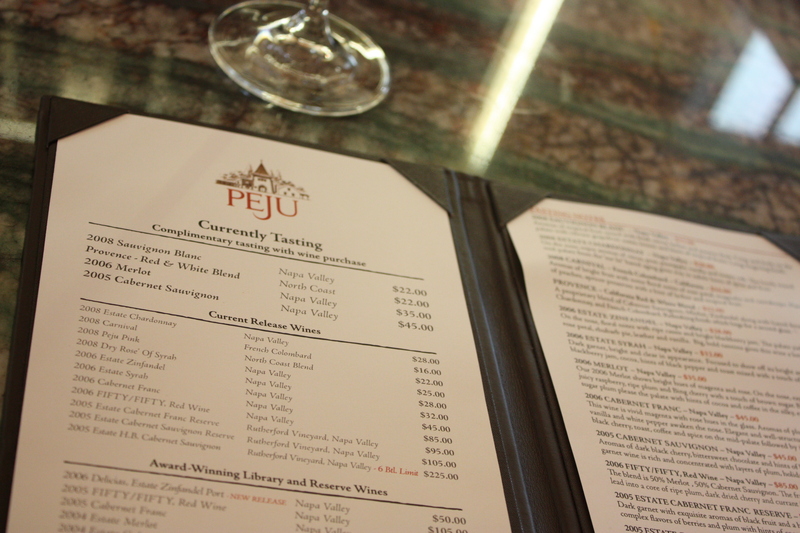 The man in the tasting room suggested a restaurant for dinner. He was Italian so naturally he suggested an Italian restaurant (Zagat also said it was delicious). 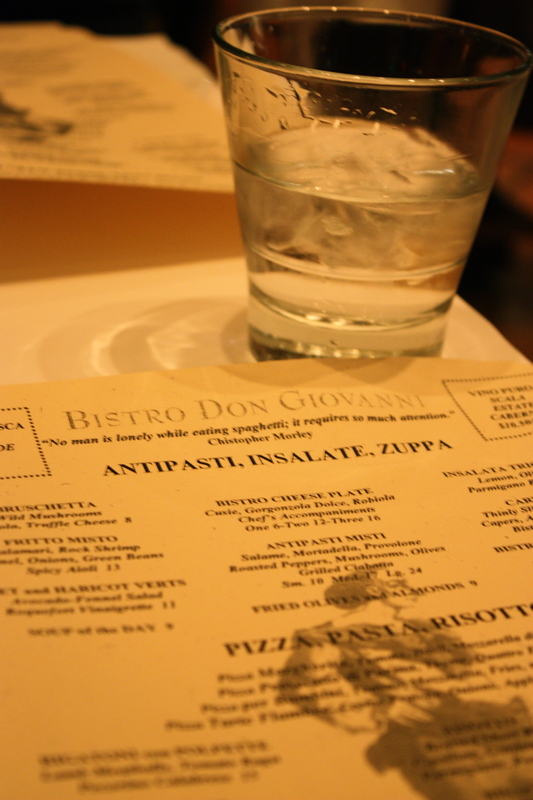 So for dinner we went to Bistro Don Giovanni. We were wined-out so we stuck to water. 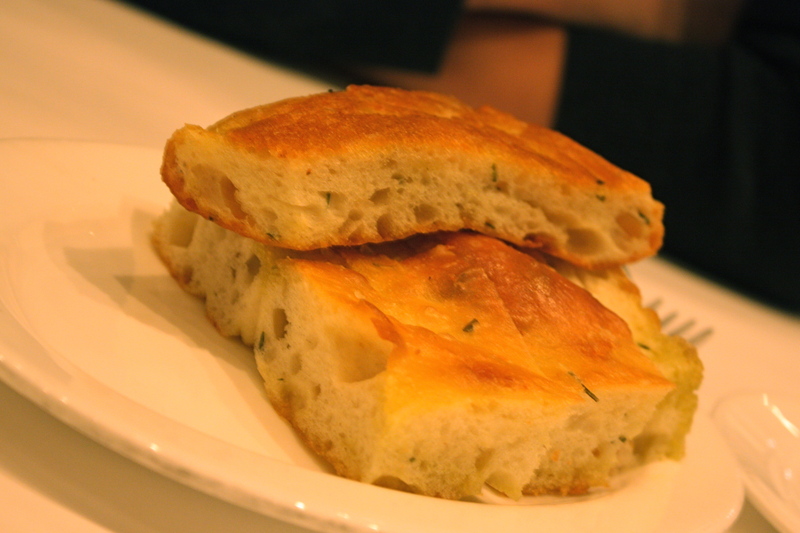 First, we were served some rosemary focaccia. It was extremely oily, but naturally very delicious! 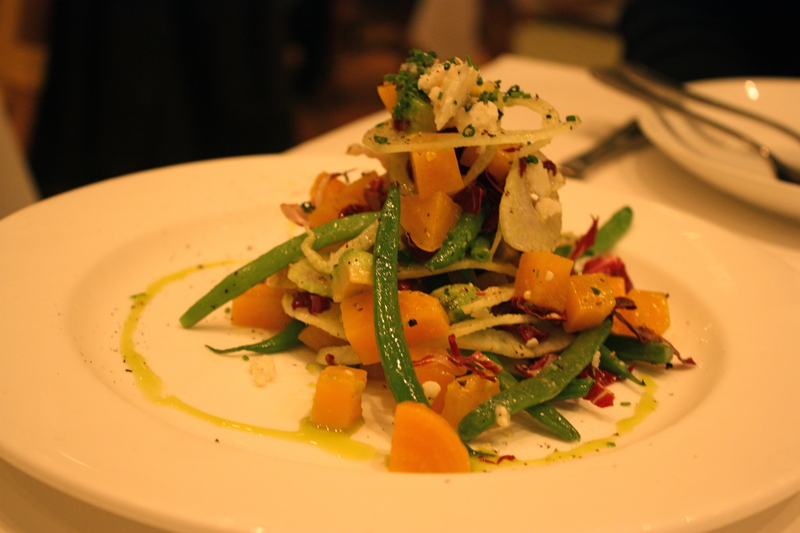 The lovely fella and I shared a beet and haricot verts salad with avocado, fennel and roquefort vinaigrette. This was very good. Light and flavorful! 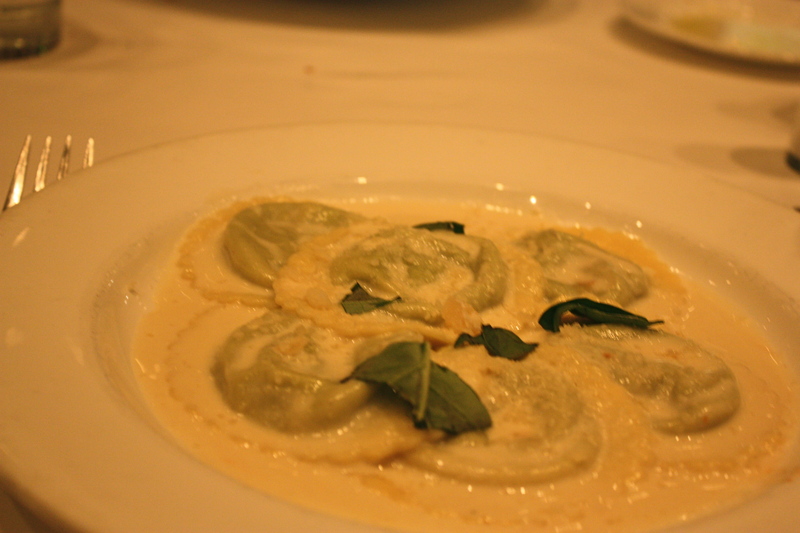 As an entree, I got the Ricotta and Pesto Ravioli with a lemon cream sauce. This was OOH SO GOOD! I can’t even tell you how delicious it was! I love lemony things but this was literally out of this world! 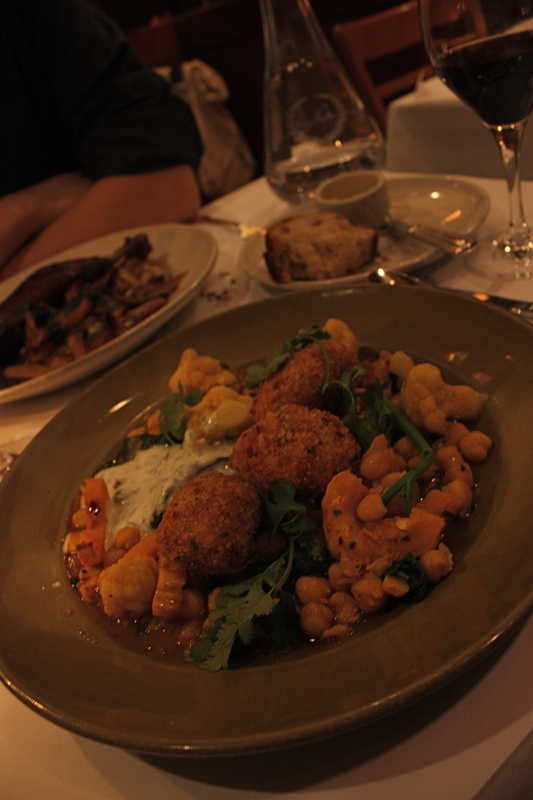 The lovely fella got an (unphotographed) Rigatoni with lamb meatballs. He enjoyed his as well! 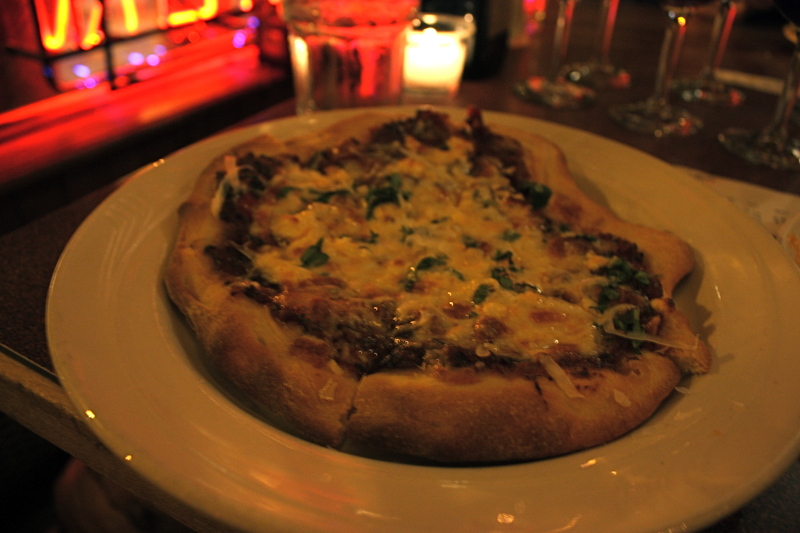 I definitely recommend Bistro Don Giovanni for anyone going to Napa. 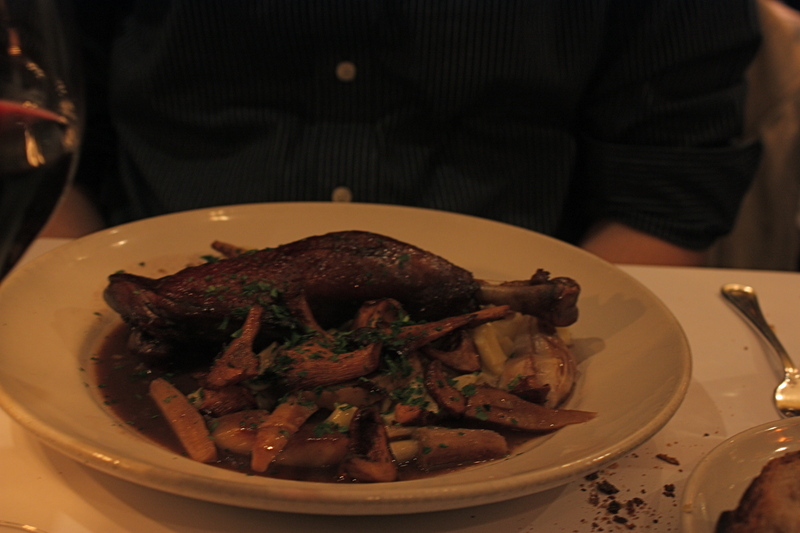 It was delicious and reasonably priced! Warning: Hipster Hating Ranting to Come! The next day we left and stopped in San Francisco for breakfast/lunch. We went to Tartine Bakery. This hipster watering hole was delicious! I got a 3 Cheese Pressed Sandwich and the lovely fella got a ham croque monsieur. Mine was simply to die for! It was also HUGE! I ate 2/3 of it and thought I was going to explode! 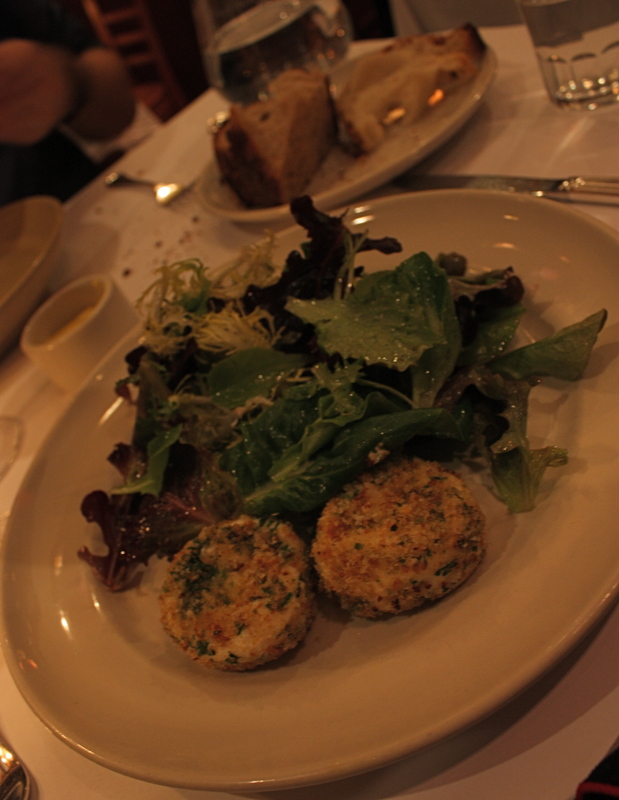 The food was fantastic (I seriously can’t get over how good this place was); however, I didn’t like the cafe itself. It was ridiculously crowded with hipsters talking about Europe and art. I didn’t feel like I could really enjoy my meal to the full extent. I also felt silly pulling out my camera, maybe I would have if I had been sitting outside with a little more arm room. I literally felt like I was living in the this blog. I’m not sure why I was so irked by the patrons of this place. I think it just felt a little pretentious to me. Strangely enough, the place was kind of dirty too. You bus your own tables (which isn’t a problem at all) but that means all the tables were really dirty. The occasional wipe down would have been appreciated. Now we’re back in Mountain View trying to figure out what to do the rest of the day! 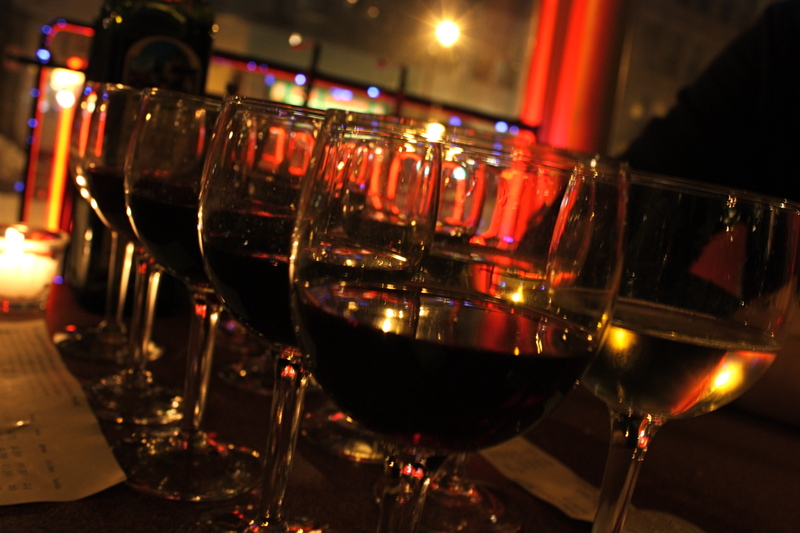 Maybe we’ll have some more wine… because obviously we haven’t had enough… On that note, this blog is supposed to be about healthy eating… don’t worry that will resume soon! When I’m back at home (aka Ithaca) I rarely eat out plus I have a healthy plan for the next few months, more on that later! Today, the lovely fella and I met my friend Emily in San Francisco (aka The City… I understand that on the East Coast “The City” means NYC but here it means SF). We met at the Ferry Building because I’ve been wanting to go to the Farmer’s Market there for a long long time. 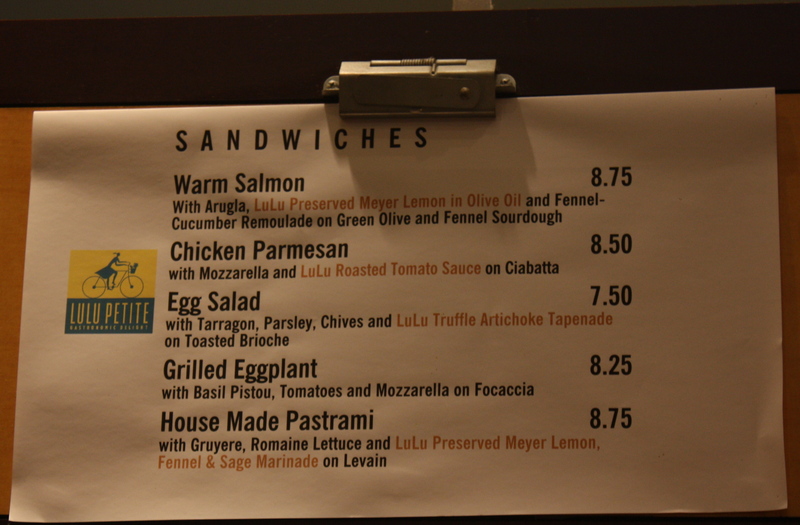 Upon arriving, we were all starving so we had lunch in the Ferry Building. 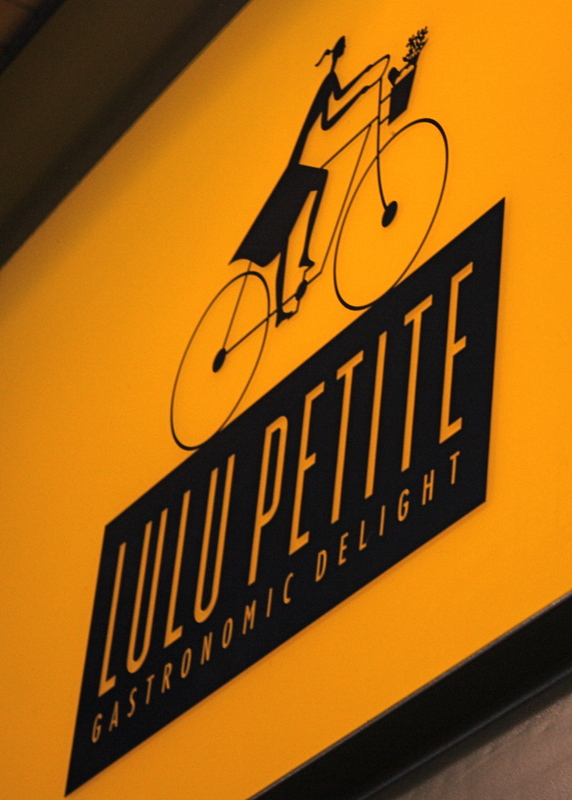 We stopped at a sandwich shop called Lulu Petite. 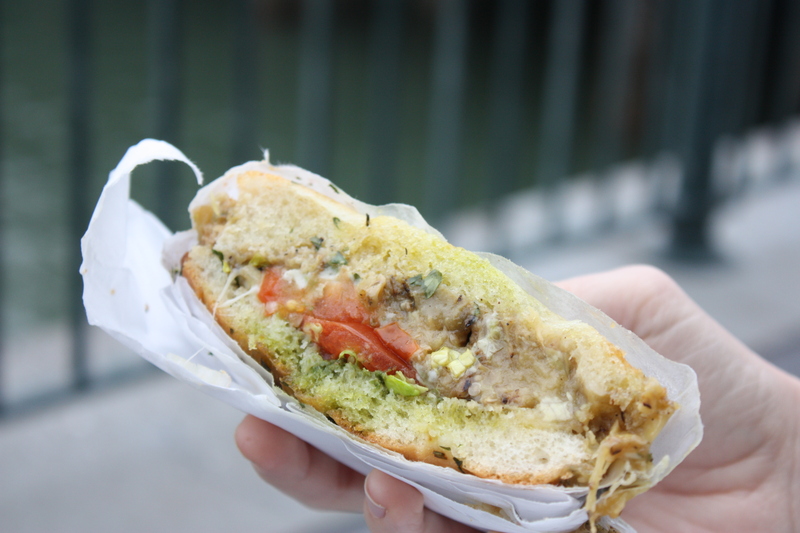 I got a delicious eggplant sandwich. Ooooh soooo good! Words can’t even describe how good this was! Then we walked around the Farmer’s Market for a bit, where I bought a persimmon! 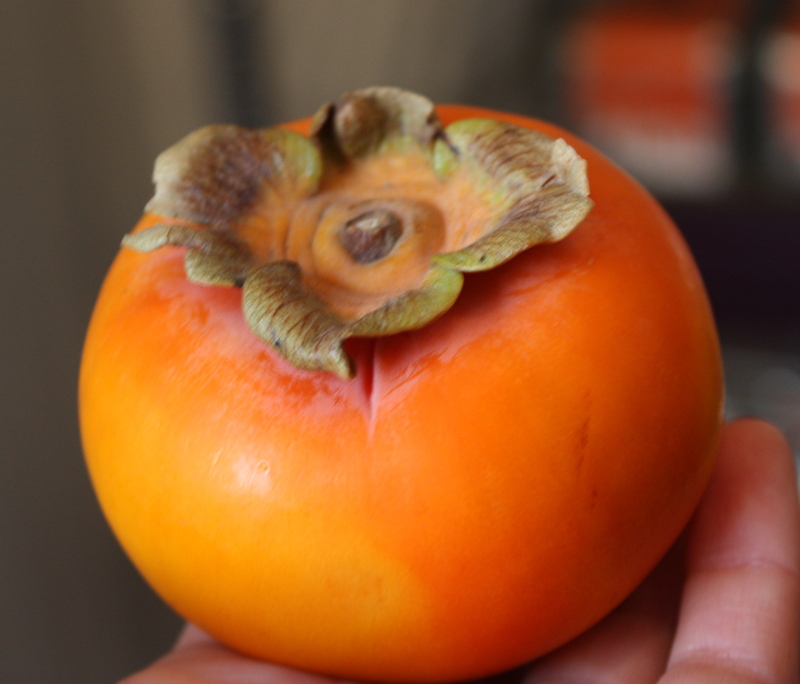 I love persimmons. They’re so expensive in Ithaca ($2 each! Can you believe that!!?!?!) Here I got 4 for $2.95. Still pricey but not as bad as in Ithaca. Colorful and delicious! 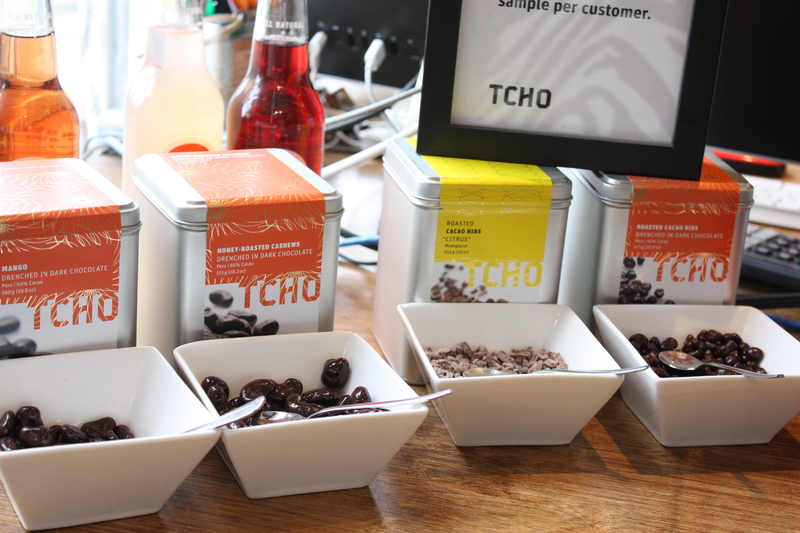 Then we headed to Tcho! 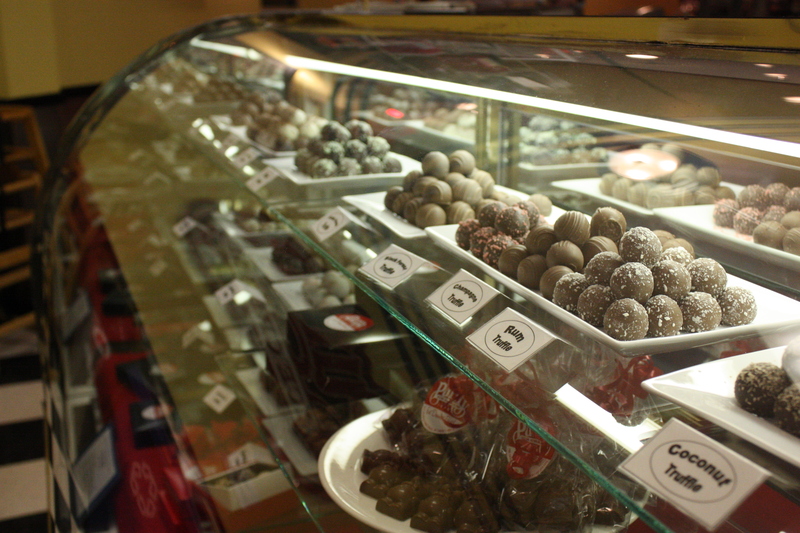 A chocolate factory located on one of the piers! 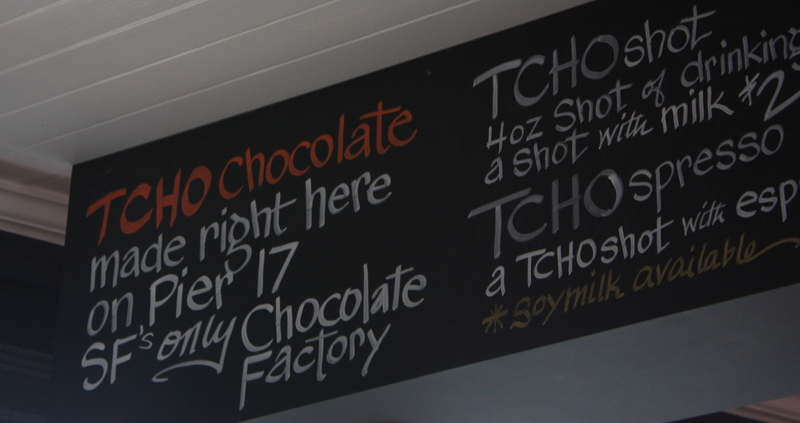 And I got a shot of chocolate. Oh my goodness! This was heaven in my mouth! So rich, so good! This was the perfect amount! 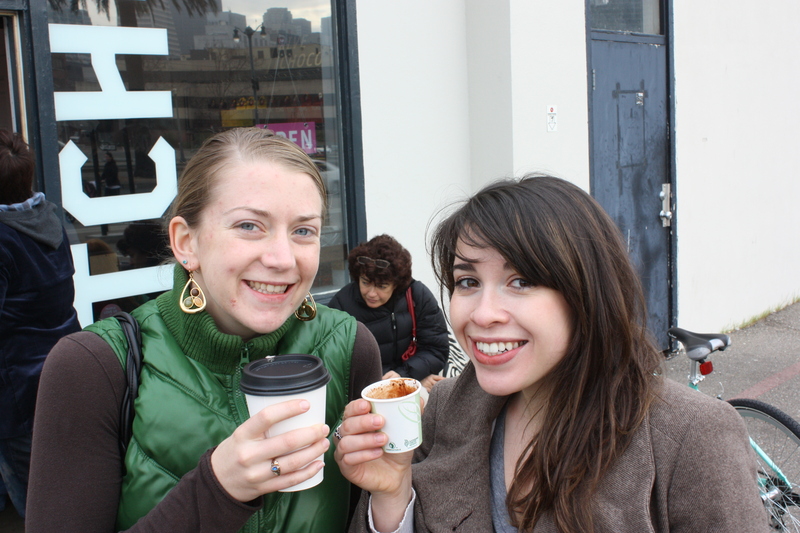 Emily got a hot chocolate which was also delicious and perfect on this chilly day! The rest of the afternoon was spent perusing stores throughout the city. Randomly, we ran into my friend Alex at Anthropologie who was shopping with his girlfriend. It was so nice to see him! He’s a superstar living in the city now in a sweet apartment and working for Yelp! Then after many hours of dragging the lovely fella to store after store, we met up with Emily’s fella, Joss, and headed to dinner. 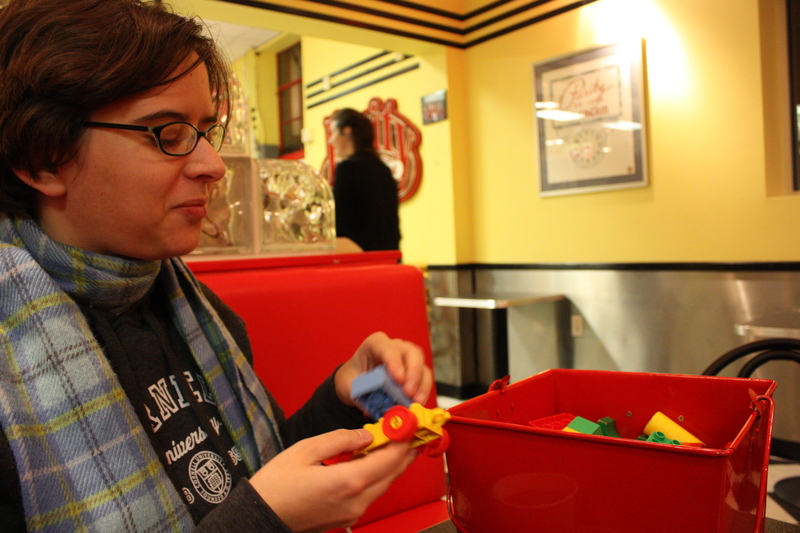 We went to Puerto Alegre a Mexican restaurant in the Mission. Oh so good as well! I had one enchilada! Sadly no pictures as it was really dark in there. I had a fun food filled day with friends! I hope your day was fantastic too! This morning I did a quick work out in the lovely fellas apartment gym. It was so nice to use a gym again! I wish I lived in an apartment building that had a gym! Then we headed to Oakland for the lovely fella’s dentist appointment. The appointment was a quick check up (took literally 5 minutes), then we had a quick lunch in Emeryville. We had a few hours to kill before out dinner at Chez Panisse! So we went to every Marshall’s in the Bay Area looking for these red pumps that I’m dying to get. Every place has them, none in my size! Breaking my heart! 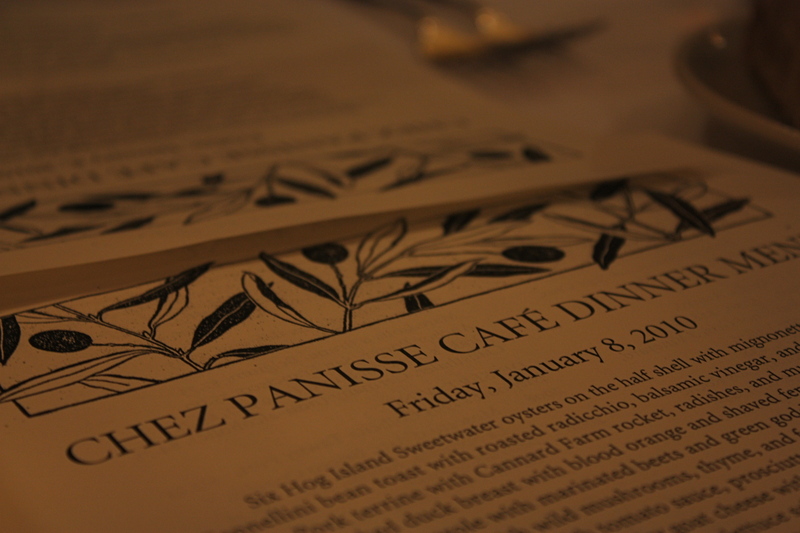 On to Chez Panisse… Chez Panisse is Alice Waters’ restaurant in Berkeley. In the four years I lived in Berkeley I never went because it’s a bit pricey. We went to the Cafe (as opposed to the restaurant downstairs). The menu changes daily so we didn’t know what to expect when we got there. 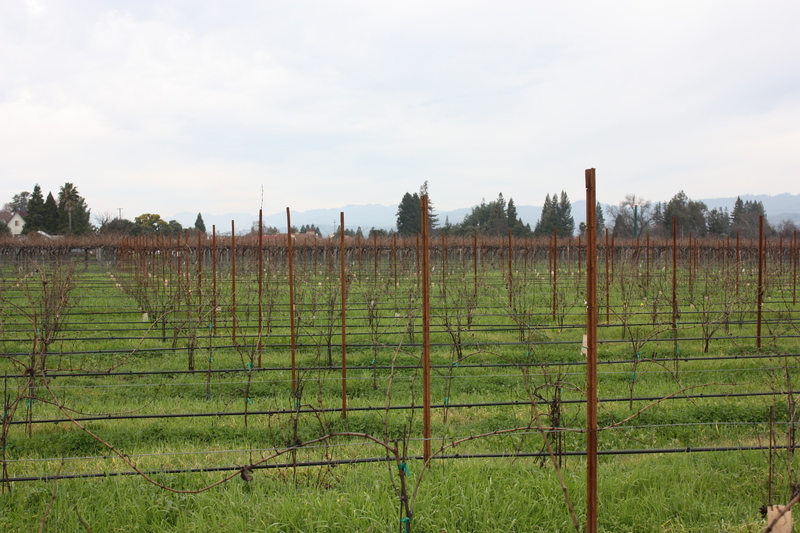 According to the menu, their “produce, meat, poultry, and fish come from farms, ranches, and fisheries guided by principles of sustainability,” which is an added bonus! 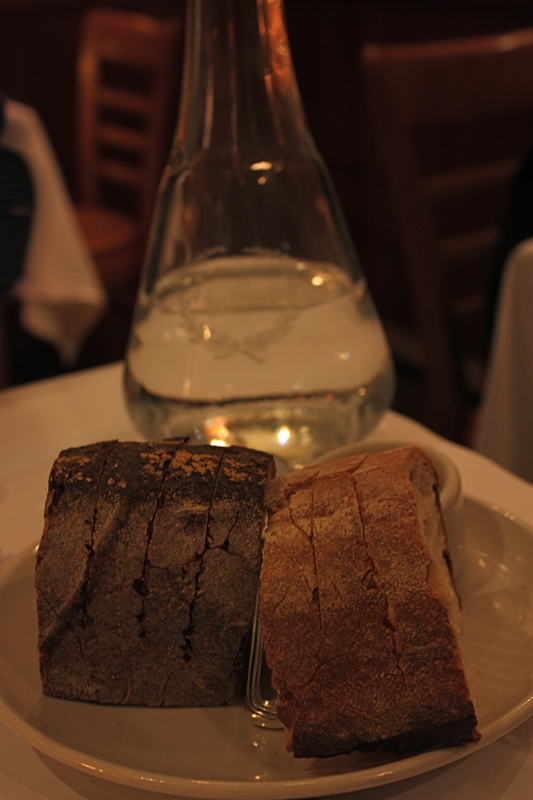 We arrived and were served some bread to enjoy with our wine. Very tasty! 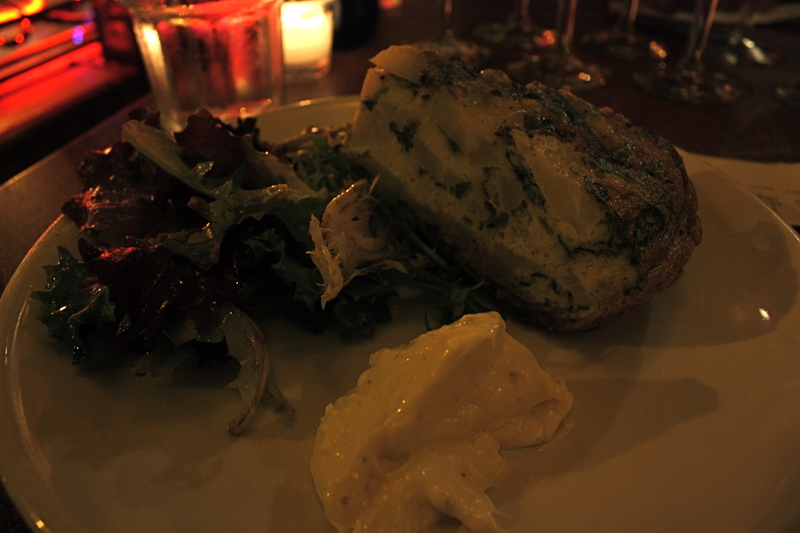 I started with the “Baked Andante Dairy goat cheese with garden lettuces.” Oh goodness… this was DELICIOUS! This may have been my favorite thing all evening. 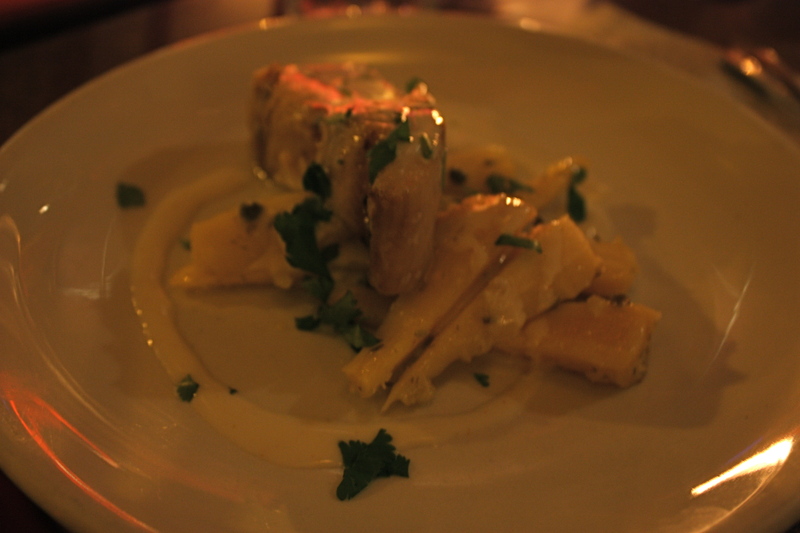 The lovely fella got the “Sunchoke and celery with white truffle oil.” This was very delicious as well. 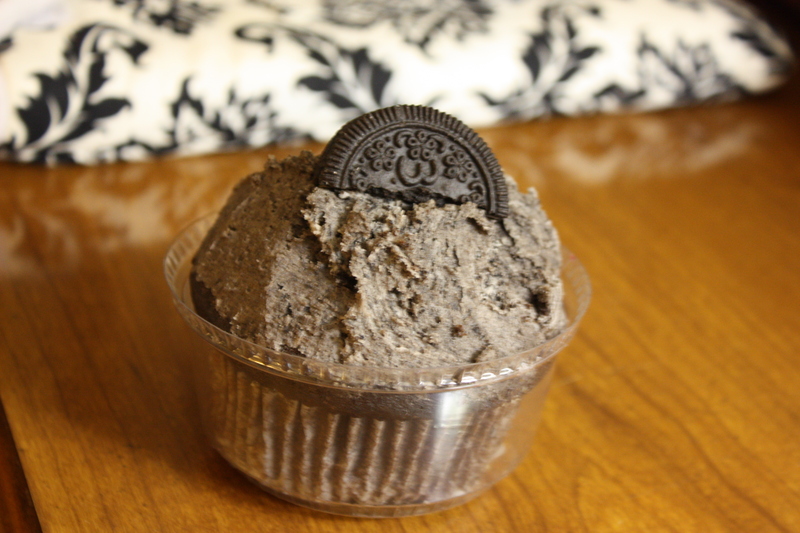 Nice and creamy. 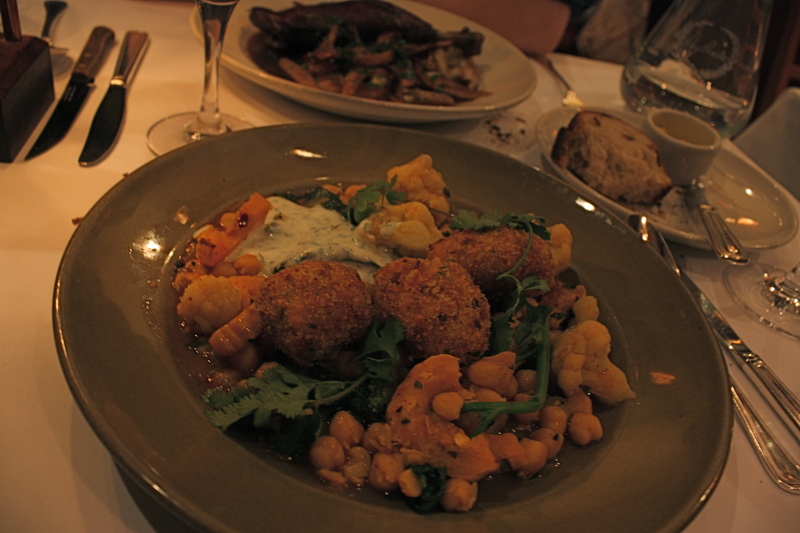 For my entree, I got the “Fried butternut squash bondas with Indian spices, chickpeas, cauliflower, and mint raita.” This was a fantastic flavor combination. 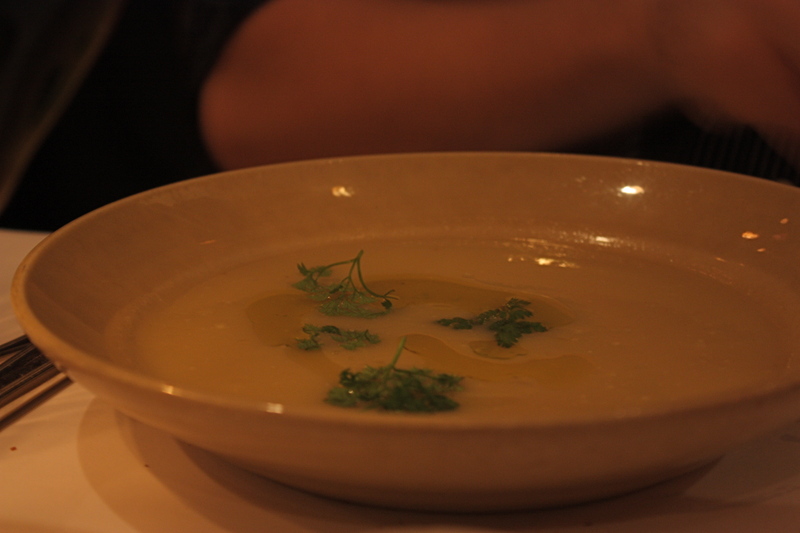 The mint raita made everything especially delicious. 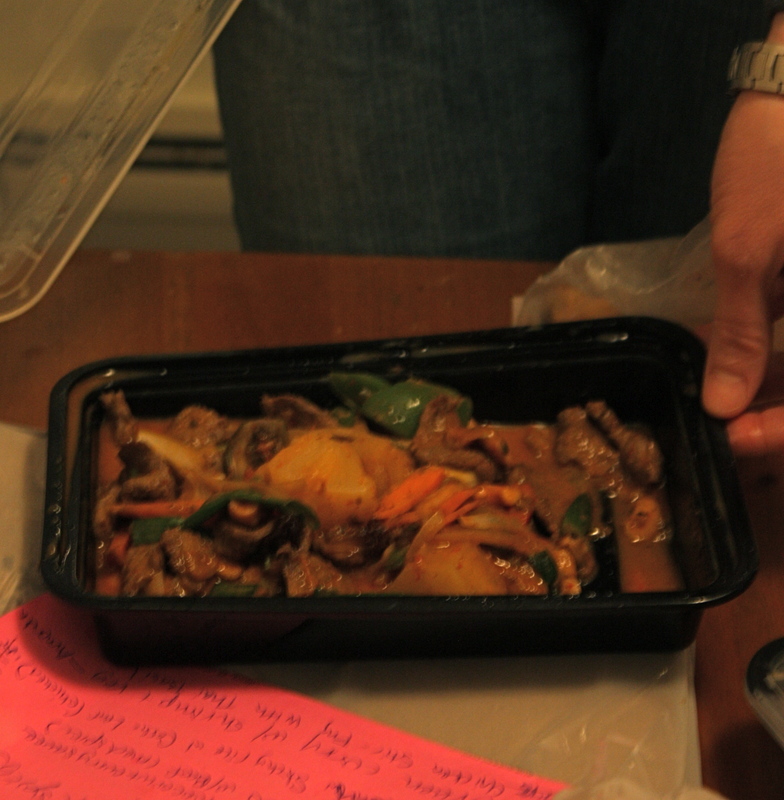 and hand-cut noodles.” I tried some of the mushrooms and noodles. This was OUTSTANDING! If I ate meat, I would definitely order this! 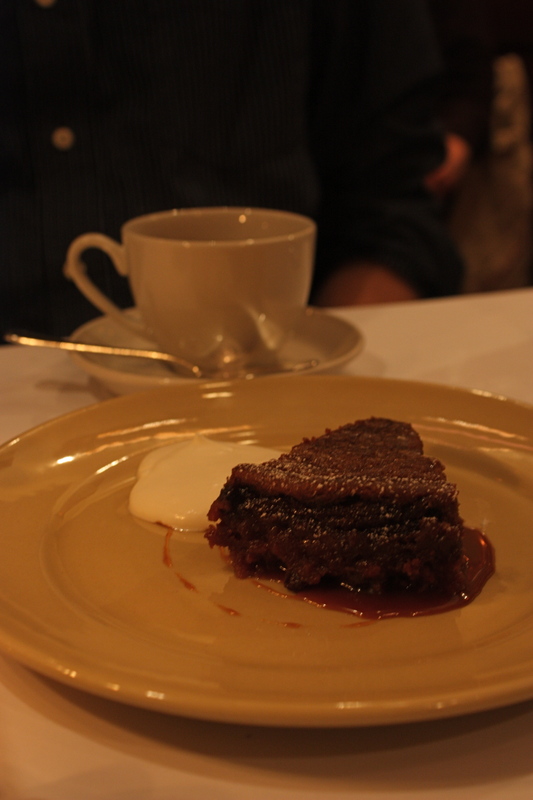 For dessert, we shared the “Hachiya persimmon pudding with bourbon cream,” along with some coffee. 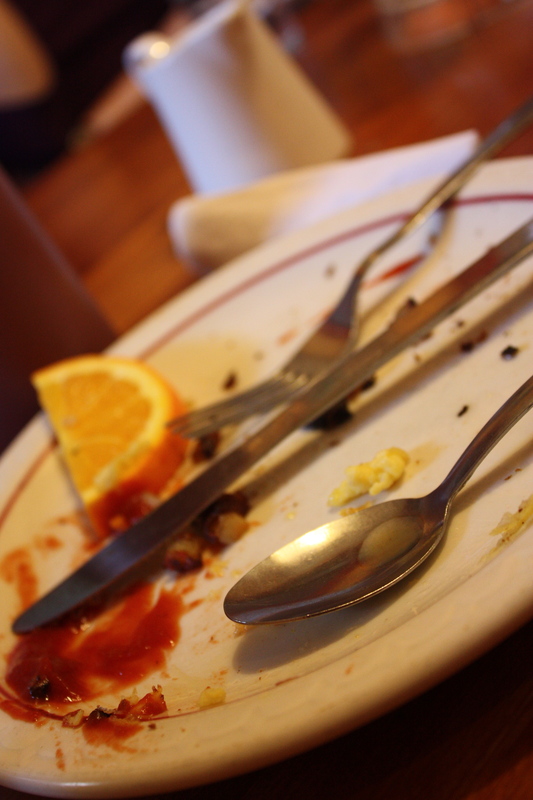 This was the perfect end to the meal, not too heavy and not too sweet but oh so good! Tomorrow we’re going to San Francisco to meet up with some friends and hopefully enjoy the city and the day! 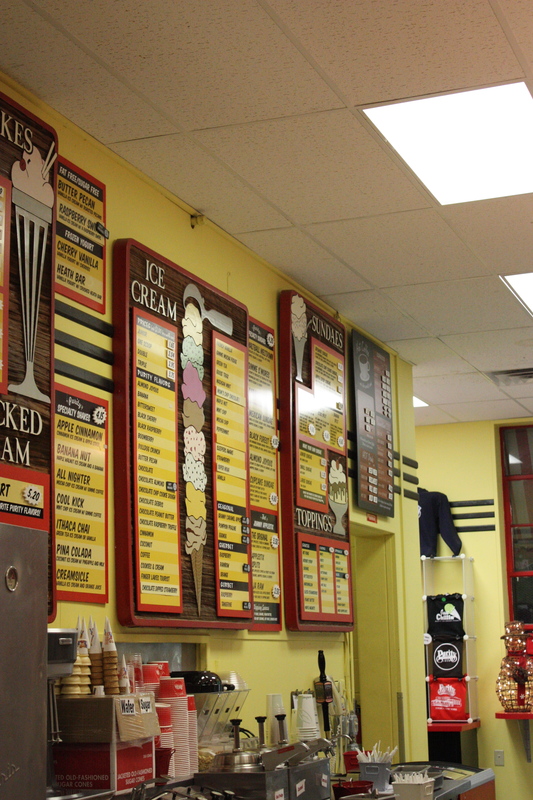 Did you know: Ice cream sundaes were invented in Ithaca, NY! 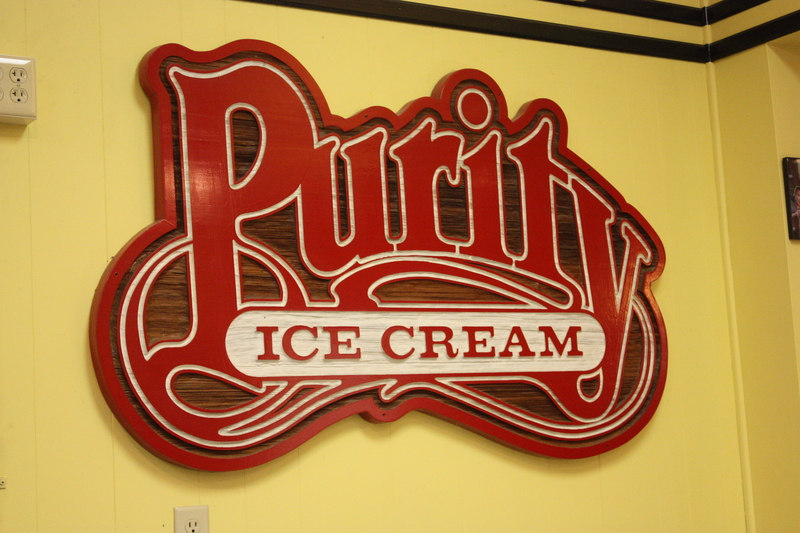 In honor of that, and the fact that my friend Sara quit her waitressing job, a few of us took a study/paper-writing break and went to Purity Ice Cream! This place is like the ultimate sweet shop! 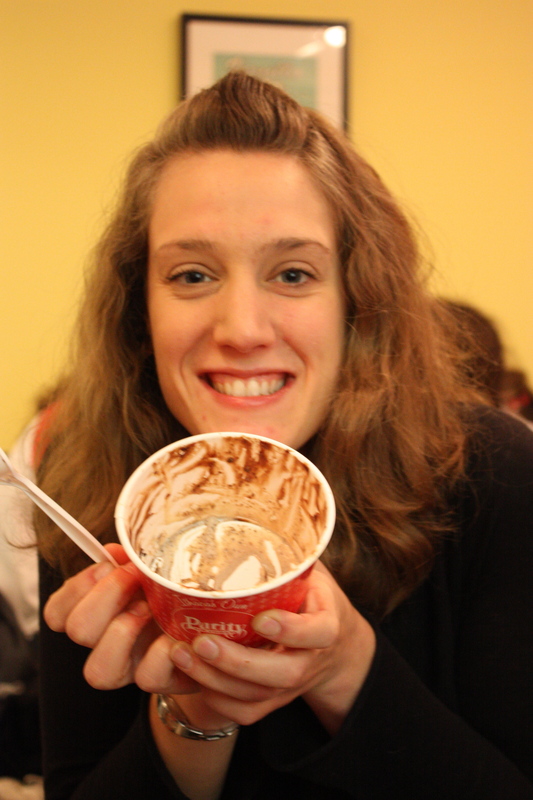 Sara and I shared a Brownie Sundae with Goose Traks and Bulldog Crunch! Mmm delicious! On to a long night of paper writing! Wish me luck!